Wilderness is a wonderful heritage. Increasingly people are becoming aware that much more needs to be done to protect and preserve this precious legacy. If love for wilderness joins hands with the knowledge and wisdom of the experts in the field, then there is room for greater optimism for the future. I understand that dedicated professionals and many experts from across the world have come together for the conservation of amphibians in India. Conservation is an intricate issue and it requires the combined efforts of many brilliant minds and the synergy of many concerned hearts to successfully tackle the challenges that we face. Indian is a country rich in astounding biodiversity and a hotspot for a wide variety of amphibians. However several species of amphibians are only known through their descriptions and have not been found, nor reported ever since. But I ma really glad that the universities an researchers of India have combined their efforts along with other universities and researchers across the world and joined hands to find these lost species of amphibians in India. 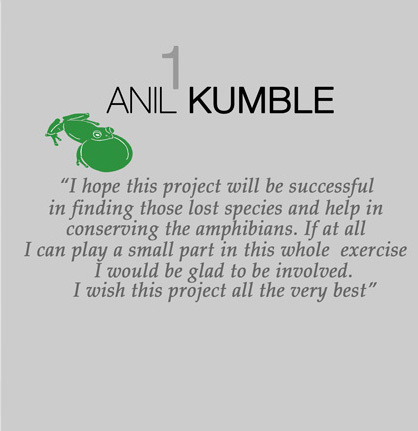 I hope this project will be successful in finding those lost species and help in conserving the amphibians. If at all I can play a small part in this whole exercise, I will be glad to be involved. I wish this project all the very best.